WACKY PACKAGES DECADES - Similar to the Old School series, but new Wacky Packages parodies for products in each decade - 1940's, 1950's, 1960's, 1970's, 1980's, 1990's, 2000's, and 2010's. WACKY PACKAGES MEET THE GARBAGE PAIL KIDS - GPK cards with Wacky Packages characters joining them. BTW, the converse of your second idea was already done in the 2016 GPK Prime Time Trashy TV Wacky Packages insert set. It included eight cards of GPK characters appearing within classic Wacky images. Maybe I'm alone, but I'd be fine with continuing Chrome with Original Series 4-16, including sketch cards, mixed-up characters, and altered art characters. Maybe we could even suggest some good candidates for altered art characters (similar to the switch of Quacker Oats and Koduck in the original Chrome series). And maybe make them a little less scarce than in the original Chrome series. I certainly wouldn't be opposed to a Chrome continuation. I didn't care too much for the obnoxiously thick borders around the sketches however. I just hope there is another Wacky series. The lack of promotion and distribution on this one worries me. I am a big Wacky Chrome fan. Let's do it again please. GPK'ers have been asking for another Chrome for a long time and keep getting told 'no way, does not make enough money', so prospects seem dismal at this point. 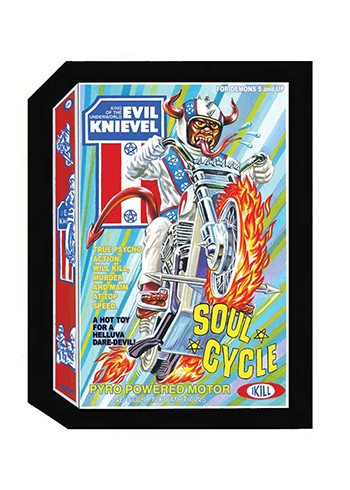 If Wacky Packages Chrome did not make enough money', it's surely because there wasn't an official binder issued with the series. HA! One has finally been found in oregon, so they are out there. Only 24 left! They did make it! No longer lost. Does this mean we've lost a lost item? Keeping expectations within reason, what I long for the most is to see a continuation of the ANS, with attention to high-quality renderings, marketed and priced the same as before. Whether it has to be called 2018 ANS 1, 2019 ANS 1, etc., doesn't matter a whole lot, as the past few series already established this new naming convention. I would like to see Wacky's placed in Wonder Bread again. How about Wacky Packages Cereal too. The box would be pretty cool. Maybe the cereal could be box and can shaped corm puffs. MMMM. Man! I have such fond memories of reaching down into a package of Wonder Bread and pulling out a card!!! That's kind of what I remember, too. The two GPK series did well at first, but the WP series didn't and that, combined with the fact that it cost too much money to keep it going, was what ended the Chrome concept. If I'm wrong about this, however, please tell me. These are my best Wacky memories, my brother and I racing down to the corner store on our bikes, running inside, and flipping over a couple dozen loaves of bread to find a Wacky we didn't yet own. As with many kids, we avoided as many chores as possible, but running to the neighborhood store for mom wasn't one of them. In fact, we gladly volunteered. And it's a damn fine dream! That's a good idea. Topps could do three series at a time again (4, 5 and 6; 7, 8 and 9; 10, 11 and 12) and then the last four (13, 14, 15 and 16). Only this time with the Lost Wackys, please try to put in the lost Wacky Ad, Mixwell Hearse! They should've put it in either the Lost Wackys subset or, at the least, the Wacky Ads subset the first time and they blew it royally! The only question that I've got is, how many OS Lost Wackys are left in order to make subsets for all of these possible series? Mr. Stubble - Here is the Unofficial Binder, just for you! Regarding the next series - Absolutely love the idea of the 1940s, 1950s, etc...... a whole new untapped area to poke fun at! Can you Imagine!!! Neil doing Rosie the Rooter as Rosie the Rooster!!!! KEEP IT SIMPLE!!!!! Not 8,234,678,222,113 border variations and back variations!!! FTLOG!!!!!!! Finally, Chad nailed it, HORRIBLE distribution at retail, I have hit 4 Targets, and only 2 blaster boxes in two of the stores and NO replenishment...... SAD!!! BONUS SERIES - Neil's Crossover Wacky Mars Attacks - The whole 1-16 all done in their Mar Attacks Wacky Versions! Oh I'd totally dig it if I could get some of these newer series out of the BB card binders! So I need your assistance Richard. Do you have an example of what type of binder to get? You use like glue sticks to attach the graphics or do you get binders that have places to put the inserts? If you could perhaps post a pic or two of the finished binder(s) that'd be great! I already came up with this idea and brought it to Topps when the last Old School series came out back in October. It's talked about in the Old School 6 thread. We are discussing it. So I'm thinking of seeing if they might be into doing a big set like this every 3 months (in between would be the regular holiday and event mini sets). Maybe Old School, then Postcards, Old School Through Time; thinking about doing sets from different eras like the 80s or the 50s or even the 30s. So imagine a 1930s style packaging for Planters as an example using the lingo, fonts and character designs from that era. I think that would be pretty cool. Lastly, Wacky Packages NOW (this would be an ANS style set). Four of these a year and the retail set. Thoughts? Mr.Stubble - I used a 3" notebook from OfficeMax with the clear exterior with the ability to insert sheets of paper (printed on color printer of course) - Laid out the notebook covers in PowerPoint with scans of my cards. - Don't forget where you came from, our WackyRoots! Keep the Old School rolling. The oversize cards from the Movie series is pretty cool. titles that were only seen in the set like Floral. Sorry, any 16 the titles would BE great.